What is ROFL? Some things are best defined by what they are not. ROFL is not the traditional chat acronym "Rolling on the Floor Laughing". Instead ROFL is a social entertainment love story. Voxox is not just another pretty telecomm company. We're here to play! You may have seen our curious tweets this month and you may be hoping that we'll tell you what's going on! We're just here to tease and entice. 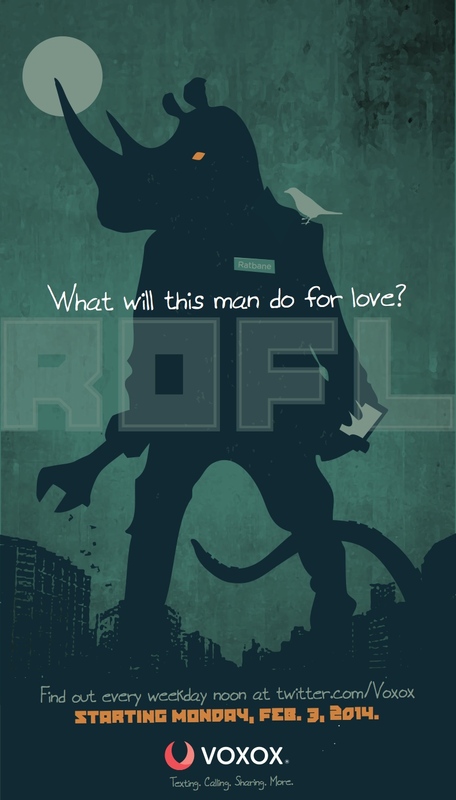 Ratbane Rhinoceros of ROFL: A Rhinoceros and an Octopus Find Love, a Voxox original social entertainment series is almost here and he really wants your help. February marks month one of this exciting blend of advertising, social marketing and entertainment. Every workday from February 3 through May 2 we will be posting a new episode of ROFL to Twitter at noon. Then we will reposting an extended version of the same episode to our Pinterest, G+, FB and Tumblr. AND we need your help… in fact, it is ONLY with your help that we’ll be successful! So please tweet, retweet, share, like and comment. We’re talkin’ super silly entertainment like you’ve never read it before! #ROFL Starts Feb. 3 and then at noon every workday!